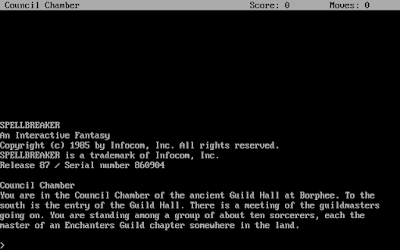 From the earliest days of the company, Infocom had one tradition: a new Zork title released every fall. After Zork III, the baton was passed to the Enchanter series which, as patient and dedicated readers know was just the second Zork trilogy. 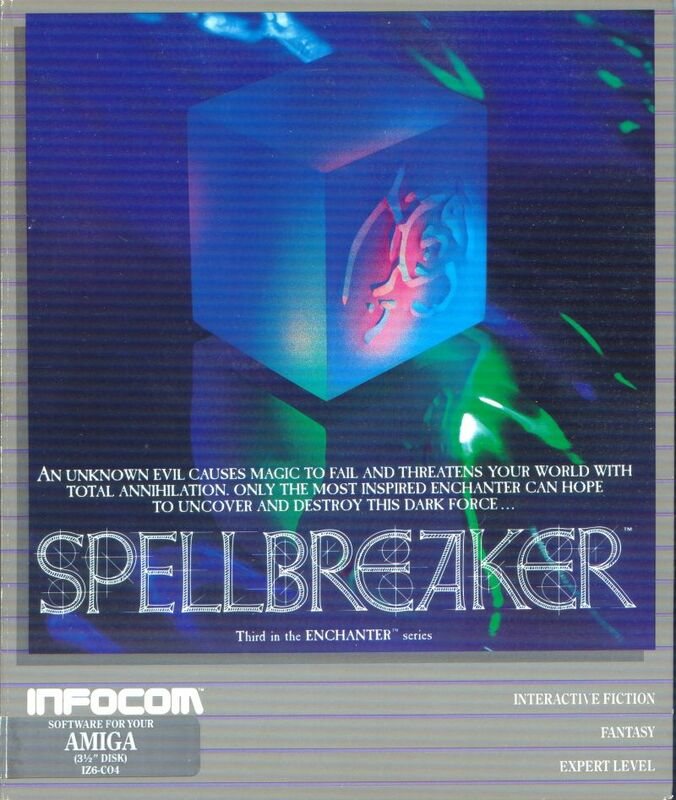 October of 1985 was no exception with the launch of Spellbreaker, the conclusion to the second Zork trilogy. But 1985 wasn’t like previous years at Infocom. Layoffs had begun to stem the bleeding from Cornerstone’s commercial flop. A Mind Forever Voyaging wasn’t a commercial success and Fooblitzky had sold only five hundred copies by mail-order. I cannot imagine what the feelings were around the Infocom offices. Could this be the end? Of course, we know it wasn’t, but Spellbreaker does mark the end of one era. It is the last of the original six Zork games. Other than a 1997 marketing tie-in, it’s the last Zork to be written by the original collaborators, Marc Blank or Dave Lebling. It’s nearly (but not quite) the last game to be released by an independent Infocom. It’s also one of the games that I have most looked forward to playing in this marathon. In some ways, Spellbreaker is a return to form for the Zork series. After handing off the reins to their flagship series to the ever-capable Steve Meretzky for Sorcerer (1984), Dave Lebling returned to tackle this game solo. Lebling has been one of the most prolific designers for Infocom with both a literary style and a penchant for strong puzzle design. In addition to co-writing the first four Zork games, he also wrote Starcross and received a co-credit for the story on The Witness. The development of Spellbreaker should have been a well-trodden path, but it did hit a few wrinkles. The biggest issue was, strangely, the title. Lebling wanted the title to be Mage, a natural continuation (of a sort) from the previous two games. The title would represent the increasing maturity of the protagonist from a lowly “Enchanter” to a powerful “Sorcerer” and then to a presumably more powerful “Mage”. While I understand the desire for theming, I agree with the push-back from the marketing folks. Those three terms do not represent (to me) anything like a progression and I wouldn’t necessarily be able to say whether an Enchanter is any more or less powerful than a Mage-- and this comes from a deep love of fantasy literature since childhood. “Archmage” might have worked better for me, but that wasn’t one of the suggestions. Lebling was quite put off by this marketing pushback and eventually even snuck a protest into the game: a very small portion of the time, the game’s title screen will say Mage instead of Spellbreaker. A second option that was explored and ultimately rejected was to add the Zork name back to the series: Zork VI: Spellbreaker. In my view with more than a little hindsight, that would have been the best approach. At this stage, the Zork name was still selling games like hotcakes. 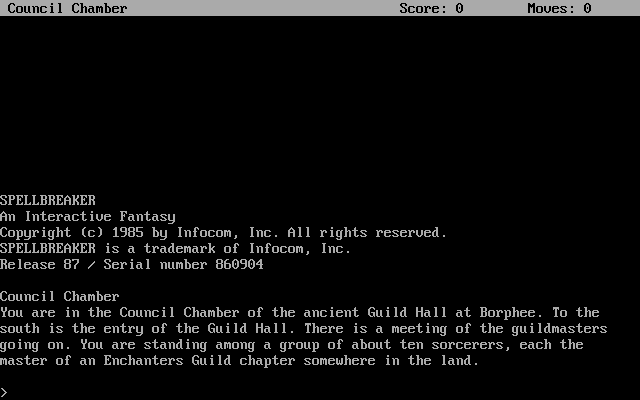 Zork I was the #2 selling Infocom game in 1985, behind only Hitchhiker’s Guide. Zork II was #5, behind AMFV and Spellbreaker. I’ll have more to say about this in an upcoming post, but the fact that Infocom wasn’t embracing the one brand of their own that was still successful in the marketplace is crazy. Whatever’s Lebling’s artistic sensibilities were, he was senior enough in the organization that he should have understood the value in a brand. Thanks in part to a name that didn’t click with consumers, Spellbreaker would actually have negative sales in 1986, as store returns for unsold inventory would offset otherwise strong sales in 1985. For my money, I am most concerned about the title because it is itself a spoiler (albeit a subtle one) for the game. Although I have not played this game more than a few minutes twenty years ago, I do know how it ends. The cards are cute at least. As in the previous games, there are a few includes “feelies” with the game. 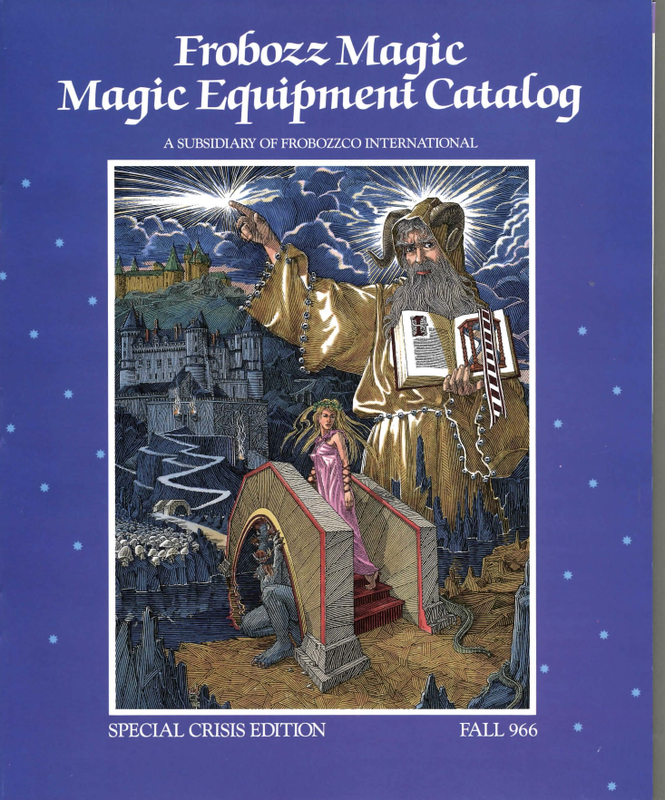 Most notably, the manual is augmented by the “Frobozz Magic Magic Equipment Catalog” for the year 966. Special crisis edition! In it is a number of advertisements for wands and magic carpets, some of which might be applicable in the game, but if so I don’t see how yet. While the previous feelies had a good sense of humor about them, I cannot help but to find this included catalog as being tacky. 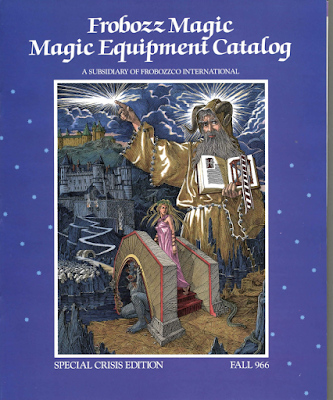 Full-color glossy product photographs and low-rent model wizards with forced smiles just doesn’t feel like Zork to me, although the series has always been a blend of fantasy and modern. In addition to the catalog, the game comes with a series of wizard trading cards-- my bet is that they are this game’s equivalent of the Infotator and will be required for copyright protection. 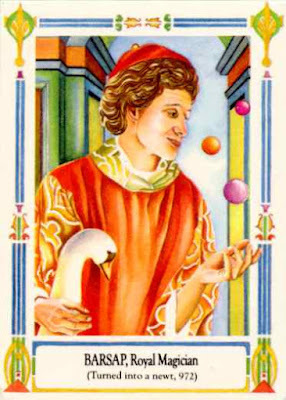 Each card contains the picture of a notable wizard, a quote, and some random statistics including their Double Fanucci handicap. What is Double Fanucci? It’s an in-universe card game, although I cannot recall if I know that because of previous games or if it’s something that stuck with me from a later one. No pompous title screens here! Of course, I am playing an adventure game and so I’m taking notes as the townsmen are speaking. The baker uses the “gloth” spell to fold his pastry, for example, while the “fripple” spell keeps monsters away from the towns. I also take the time to check my inventory: I have a burin for writing magical things like scrolls, a knife, and my trusty spellbook. My spellbook in specific seems to have been drained since the last game as once again I just have a small number of spells. There’s a brief in-game explanation that many of the spells that I once knew no longer work due to the crisis. Of those, we have our stalwarts “rezrov”, “frotz”, and “gnusto” that have appeared in all three games. “Yomin” and “malyon” were added in Sorcerer, while “jindak” and “lesoch” are brand new to this game. While I was listening to the townspeople rant about their problems, a shadowy figure snuck into the back of the room and transformed everyone into frogs! Everyone except me, that is. Why was I spared? Was it deliberate or an accident? I chase the assailant south out of the guildhouse and into Belwit Square, but he’s able to cast some sort of smokescreen and teleport away. I use the new “lesoch” spell to clear the smoke-- I have to do it twice because it failed the first time-- but he is long gone. Only a featureless white cube remains where the figure once was. 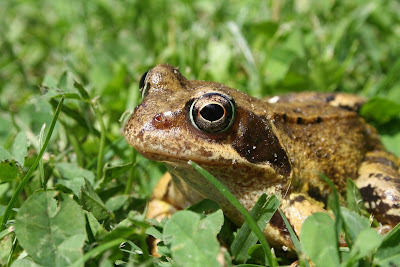 I grab it and head back into the guildhall. As I ran past before, I didn’t see some bread and fish on the table and I grab those now. I hope that doesn’t mean we have an eating mechanic in this game. It’s been a while since we’ve had one of those! I try to “yomin” the frogs to read their minds, maybe get some wisdom from my fellow elders, but all they are thinking about now is flies. Borphee awaits, but my explorations are in vain as the city is more or less an illusion. East and west just end up having me get turned around and we end up right back where we started. South of the square is the Manse where the Mayors of the city live and work, but it’s locked and guarded. Whatever I need to do isn’t that way. Fortunately, it doesn’t take me more than a few moments to figure out what I can do: in my spellbook is a new spell which I have never seen before: “blorple”, to explore mystic connections. With no better ideas, I cast “blorple” on the cube and am transported to a dark room. Since this is an Introduction post, it’s time to guess the score! The current average score for an Infocom game is 38 points. Lebling’s previous eight games are slightly above that, averaging 39 points: mainframe Zork (41 points), Zork I (35), Zork II (32), Zork III (42), Starcross (37), The Witness (50), Enchanter (37), and Suspect (38). Of those, Lebling was co-designer on the Zork games and Enchanter, while only provided some story guidance on The Witness. Lebling appears to be quite consistent in his scores and I have a feeling we’ll have a number of guesses in that range. I wonder if Lebling knew the Earthsea trilogy? The beginning of the Farthest Shore, with magic failing and all skills becoming lost, resembles the beginning of Spellbreaker. Furthermore, obgu gur anzryrff cebgntbavfg naq Trq ybfr gurve zntvpny novyvgvrf ng gur raq. And, gur nagntbavfg bs gur tnzr vf dhvgr fvzvyne gb Trq'f rivy qbhoyr va gur svefg Rnegufrn obbx. Oh yeah, the score. Let's say 43. I shall guess 36 because it's such a nice number - a square that's the product of two squares, and numerologically it adds to the very magical number 9. I will one-up Mr. Cole, and go with 37. I will go fro 40, if only because it's the closest multiple of 8 and that number has been associated with magic since The Colour of Magic for me. Big brands ignoring their strong products while they desperately try to develop new ones at their expense is nothing new in any industry though, my first run-in with this phenomena was Le Femme Nikita in the 90s, fortunately a big fan write-in forced them to at least finish the series off. When I was with my previous company, there were ALWAYS debates over how much of the cash flow we dedicated to improving service for existing products or building new products... which never sold as well as the older ones. It was a source of constant frustration for me. I think we always hoped we'd launch another goldmine and never did, no matter how much money and time we spent developing the next big thing. Put me down for 38. I enjoyed this one, back in the day, but I remember it as a very tough game. The title would represent the increasing maturity of the protagonist from a lowly “Enchanter” to a powerful “Sorcerer” and then to a presumably more powerful “Mage”. I wonder why the guild calls itself the lowest level of the Guild of Enchanters, then. A second option that was explored and ultimately rejected was to add the Zork name back to the series: Zork VI: Spellbreaker. Huh. I knew that these games take place in the Zork universe and that Enchanter began life as Zork IV, but I didn't know it was internally carried on through "V" and "VI". IMO this trilogy became its own thing and I don't really think of it as Zork games. In it is a number of advertisements for wands and magic carpets, some of which might be applicable in the game, but if so I don’t see how yet. I'm not sure how much it was carried on, only that it wasn't completely forgotten. The internal release codes for the Enchanter games were IZ4, 5, and 6. That doesn't reveal TOO much since Trinity was IZ7 and unless it has a Zork connection that I am unaware of, it breaks the mold. I'll take 39, purely because 37 and 38 were both taken and I don't want to share the glory with anyone else if I'm right! 45. I'll be optimistic. It's a great game! Note that they do spoil one of the game's puzzles towards the end of the piece, so be prepared to stop the video if that's a problem.